This little lad was a bright healthy young boy when all of a sudden he started to limp. Trying to determine what the cause was his mother felt he could have been hit by a motor bike coming home from school, although she did not know. The condition didn’t get any better, but much worse. 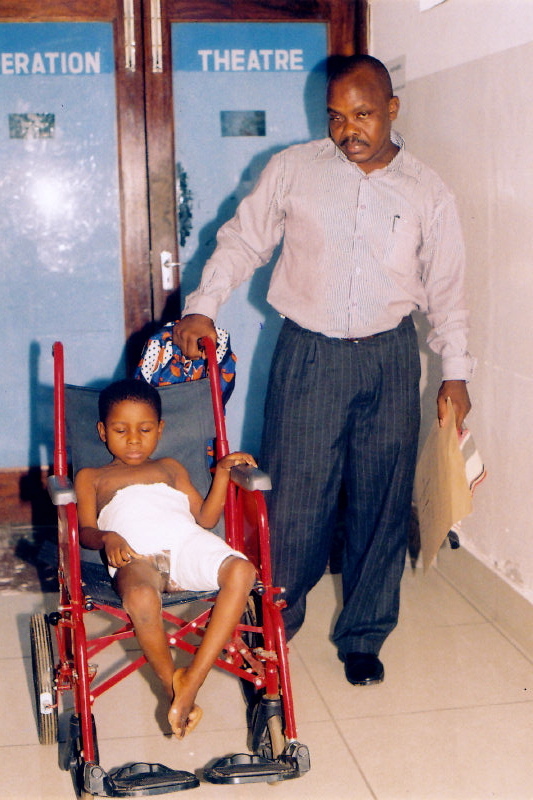 The mother and grandmother took him to the hospitals in Mombasa but got nowhere. Sue Stevens came to the rescue. Firstly she arranged for Salim to once again attend a hospital and they agreed on an operation. This was good news. Too good to be true however. They then said the theatres were full for yet another year, he had already had the condition for two years, and as it had worsened, he could not walk. Eventually through William, who has been a great support to Sue, he found a hospital and a doctor who would operate at a cost. The Devon Cliffs Holiday Park came to the rescue and raised the initial £2000 for the op. Sue and I spoke about his condition as the hospital said he was malnourished. We thought it better to have him move into the orphans home where we could ensure he had good food and rest and to make him feel comfortable, his gran stayed with him. 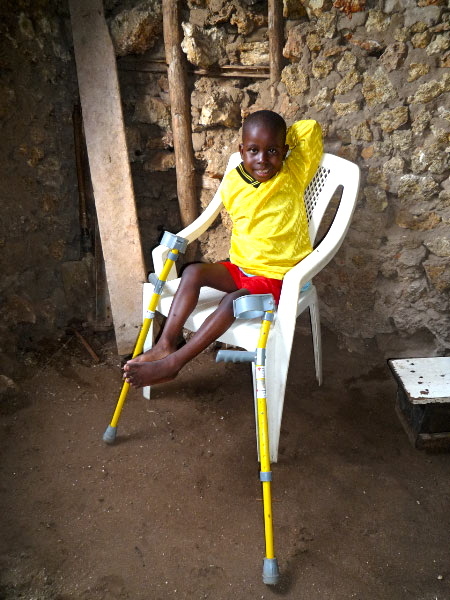 To enable him to heal and get around, Eva and the Taunton Red Cross came to the rescue supplying a wheel chair and crutches. Salim is now at home and doing well thanks to some caring individuals. Life is so hard for people in Kenya especially the vulnerable children. THANK HEAVEN FOR CARING INDIVIDUALS WHO EASE THIS DAILY!